Memories are an important thing to me, they represent happy times and times I never want to forget. I am a massive believer in taking photos of everything that happens in my life as I am a memory hoarder - I never want to completely forget anything. I have always had an interest in scrapbooking and compiling my memories into one secure place, so when my friend, Verity, was talking about starting a scrapbook, we decided to start one each. As I may be moving area in the near or far future, it's a great idea to store all of my the memories I make with my friends and family in this gorgeous massive memory book. The first image (above), is the front cover of my scrapbook. I used a large photo print of myself from Cheerz, these large prints retail at £9.50 for 10 large retro style prints. I decorated the front cover with various pieces of floral paper, ribbon and sticky gems. I took inspiration for my front cover from two album covers; Mariah Carey's Album 'Memoirs of an imperfect angel' for the title of my cover and of course, Taylor Swift's 1989 CD cover for my large polaroid centre piece. Both Mariah and Taylor are massive idols of mine so it was very fitting to incorporate them both into my memory book. The image above is a photograph of the first two pages inside my scrap book - my 'welcome pages' - it's a double page spread to introduce myself to whomever may be reading and looking inside my memory book. On the left-hand side is an almost 'blurb' about what the book contains, it's an introduction to myself and to the book. Also on the very first page, the page on the left, there are various embellishments, such as buttons, wooden frames, my old business card from 2 years ago, remnants of vintage fabrics, old lace from my nan and patterned ribbon. On the page facing this, the right page, there's a photograph of myself along with my favourite quote. These photographs are also from Cheerz, a photo-printing company of which I adore very much. Cheerz's photos are so affordable and are of an incredibly high standard. Throughout my scrapbook there are photos printed via Cheerz. I have square prints* which retail at £6.50 for 20 and retro polaroid prints* which also retail at £6.50 for 20. I also have a discount code you can use so you can receive £4 off of your order (which makes a £6.50 order only £2.50!!!) simply enter MOLQUN at the checkout! The image above shows my day out at the Harry Potter Studio Tour with my Media class. On May 3rd 2016 my Media class and I took a trip to the Warner Brothers Studio near Watford. It was such a great day with loads of my close friends. Myself and my friend Verity bought Butterbeer and matching Time Turner Keyrings each, which are nice mementoes for us both. The day out was really good, although it would have been nicer to have more time there as we only got 3 hours to look around the entire studio tour, I'd definitely love to go back, especially with everybody I went with on May 3rd. Above is my double page spread which is dedicated to my 10 month old kitten, Carnaby Cullen Quirk. It's a spread that isn't finished yet, it needs some more text on the right hand page, but it features many pictures of Carn from when we first got him up until just the other day. The material flower featured on the left page is something he used to love when he was smaller, he'd play with it and balance it on his head! Each picture of Carnaby has so many memories behind it and it's so lovely to have this book to store all of my memories and photographs in. 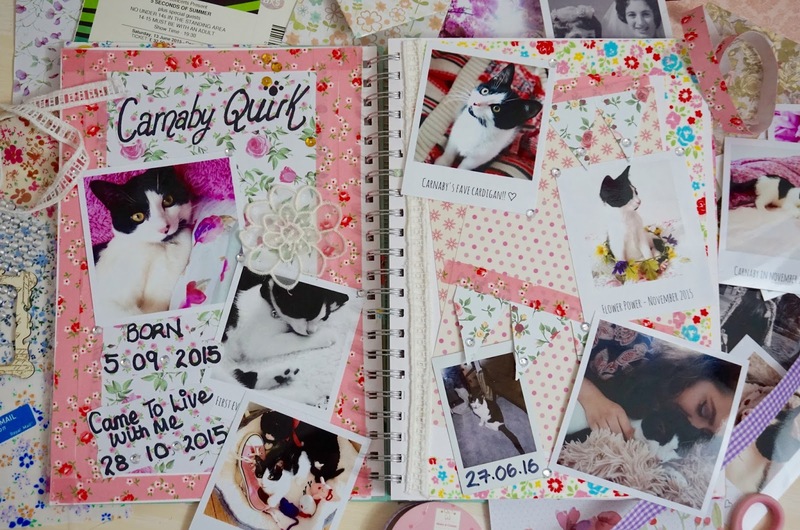 I really adore scrapbooking and I wouldn't have been able to do it without the help of Cheerz's fabulous photographs. You can order Cheerz prints online or through their app, which makes them super accessible. Their prints are affordable and of an incredible quality. The delivery is super quick and faultless! Scrapbooking is now something I do on a regular basis, it makes a lovely change from looking at a screen all of the time. It's something that is highly underrated and should be undertook more in this day and age, especially with the influx of social media and storing photographs and memories digitally. Nothing can beat looking through a big 'ole book of memories and reliving your happy times, memories and life events. Scrapbooking takes time and is an ongoing project, this book will never be fully complete, and that's what I love about it. Buying materials for scrapbooking is time consuming also as it can take months and years to source your desired vintage fabrics, ribbons and papers. Some of the contents of my scrapbook has been taken from old scrapbooks that I made when I was younger and most of the ribbon and lace has been in my family for quite some time. This book is valuable to me, valuable in memories not money. Let me know what you think of my scrapbook in the comments below, I'd love to know you thoughts. Also, let me know if you'd like me to post scrapbook updates on here (maybe monthly?) so that you can see it's progress. Let me know in the comments section below. I started to do a scrapbook this year, but I am not that creative, so I left it and I think its somewhere under my bed! This is so cute! I've never used Cheerz as I tend to use the Project Life format for my scrapbooks, but I also want to do a regular scrapbook of my holiday to Prague which the little square photos would be great for. You have beautiful photos! And your scrapbooking skills are on point! Your scrapbook is lovely! Great layout and it's a nice way to store some fun memories. It's always good to have photo albums printed up to flick through whenever, much nicer than hunting for photos on a phone or computer! 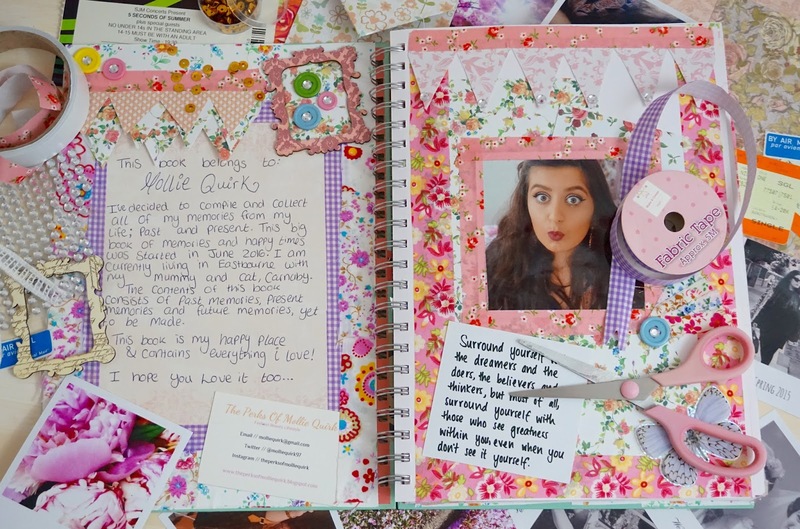 Your scrapbook is absolutely adorable! I love it so much. 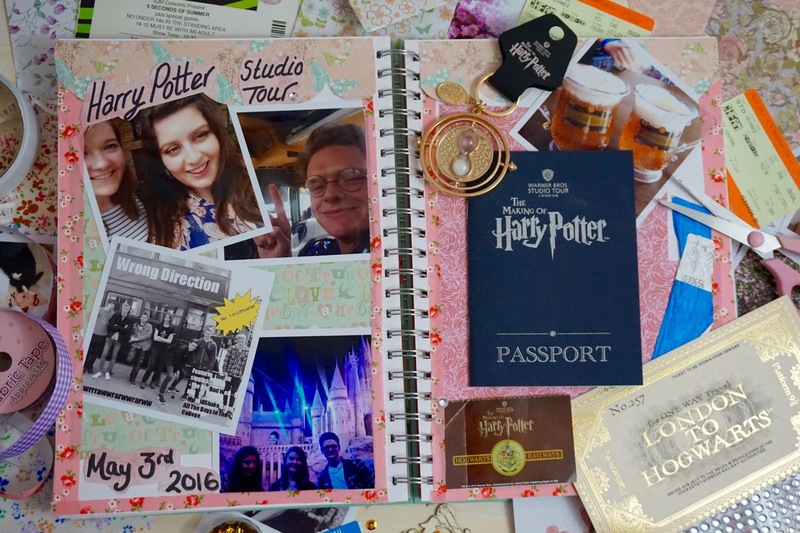 I have a travel scrapbook and I've done a spread about my HP tour visit on it too. I loved that trip and your page is amazing. You've really encouraged me to maybe post about it on my blog! Oh this is so great - you've done a really good job! I used to scrapbook and did so for about 12 years, though sadly lately I've stopped as I just don't have the time. Hoping to return to it in the future though, for sure :) Have fun!! Oh wow - such good value and what a lovely idea! I always keep all my tickets and pictures from everywhere I go but they are all sitting in a box in my bedroom. Would be so much better to pop them all into a book...thanks for the heads up, girl. Time to get my scrapbook on!!! Your scrapbook is adorable! I wish I was that crafty haha I have been telling myself for so long to make one for my travel photos and papers and I think this post inspired me to finally do it! Let me know on my blog & I'll follow back right away. Love this post mollie! I have a scrapbook of my own & this has given me so much inspo on how to decorate it!! - beautiful way to keep memories! 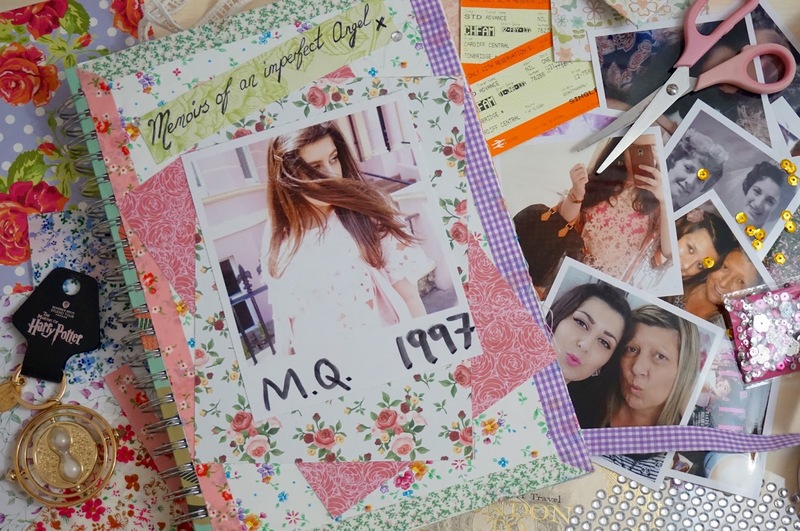 this is such a cute scrapbook, great post! Thanks for reading this post! Let me know what you thought of it below? IS THE BLOGGING INDUSTRY BECOMING DELUSIVE? AND IS #OOTD A BIG FAT LIE? All content is owned by The Perks Of Mollie Quirk unless otherwise stated. Powered by Blogger. © The Perks Of Mollie Quirk.